Freyja's Daughter Tarot – Tagged "tarot deck"
Blood Bread & Roses Tarot August 2018! Received images last night of the printed deck and box! 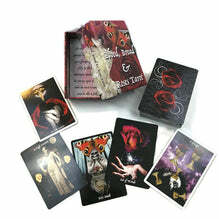 Tarot deck should be shipping out shortly and arriving in Canada in mid-August 2018. I will be setting up pre-orders as soon as the decks have been shipped from China so that I can ship them out asap once they arrive. Check out the images below, it looks so beautiful!